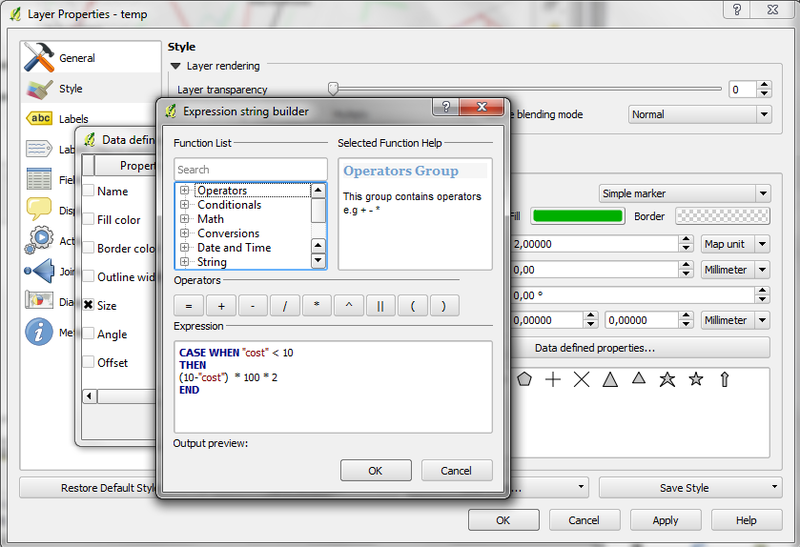 You can also use the clamp function to avoid the WHEN. Great posts by the way. Can you tag this one PostGIS too so it appears on Planet PostGIS. Disregard my comment. I just realized you have both a postgis tag and postgis category. I changed to the feed to use your postgis category since that looks more complete. The PostGIS category should be quite complete. is it correct, that the network view creates a table, where geom = NULL? However, when I continue with the drivingdistance command, and change the node number from 1 to 354 (which is an existing node in my publictransport table), the result table is empty as well. i.e. all fields are NULL. So the command pgr_drivingdistance is working. 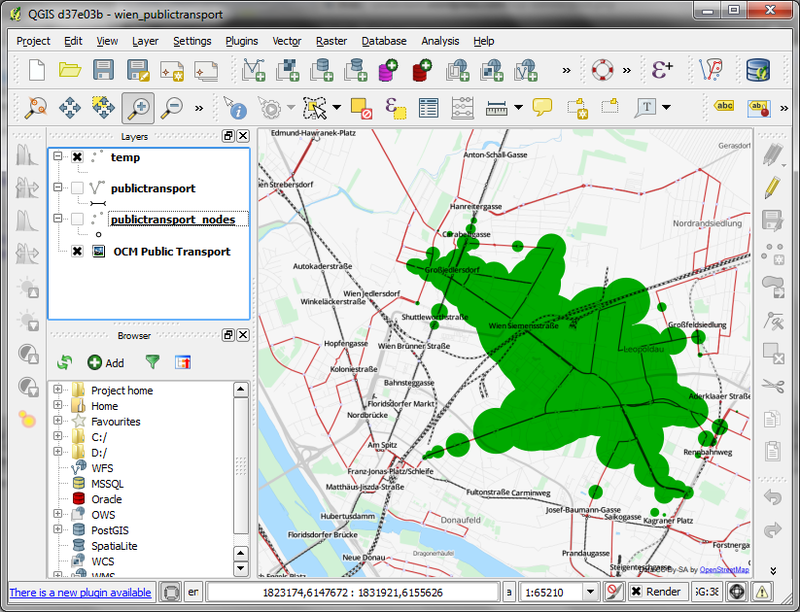 However I can not load the publictransport_nodes to view the isochrones..
What happens if you try to load the nodes? It’s hard to guess from here what might be wrong. Now it works! Thanks for your great blog! I want to use pgrouting Travelling Salesman Problem (TSP) function with PHP. This function expects geo locations in lat/lng format and will give the optimum path for a given set of locations according to the TSP algorithm. I have implemented shortest path function following a tutorial on this page. I’m looking for a similar solution. Can somebody help me? Please use gis.stackexchange for questions which are not directly related to the posts. This way, many more people will see the question and you’ll probably get better answers. Thanks for a great blog! I’m studying GIS at Stockholm University where they use ArcGIS. Without your blog and other great sources on the internet I would never be able to learn gis at home with QGIS and a Mac. I’m also totally impressed with the fact that you find the time to reply to all these questions! I’m trying to do exactly what your doing in this post, except for the fact that I already have the speed as column SPEED and the cost as column COST calculated in my attributes for the road network. (Yes, I’m not looking a public transportation but roads). My biggest problem right now is the fact that psql is a new language and I feel totally lost here. 3. Since I already have COST and SPEED I skipped the step where you calculated traveltimes. From what I can tell from my map it’s working but how do I “simply update the definition of the view network.temp” to decide where to measure this? I wish more stuff would be possible in QGIS by visually clicking instead of psql, that way QGIS could really compete with Arc. 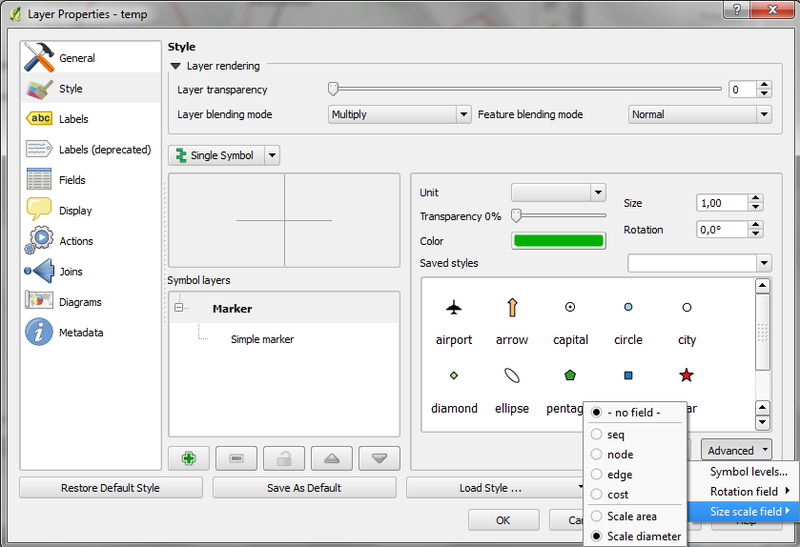 Love you experimental plug pgRoutingLayer, thats really a step towards ordinary people using QGIS, to bad the export button isn’t working on alpha shapes yet. My plan B since I need to calculate Alpha Shapes for my project is to use pgRoutingLayer to draw the polygon and then just manually draw a new polygon on top of it from a new layer. Do you have any better suggestions? To update a view, simply rerun the CREATE OR REPLACE VIEW sql statement with new settings for the source node id and the max cost value. Enabling the export for alpha shapes is definitely on my todo list, see https://github.com/sanak/pgRoutingLayer/issues/2. Had the feeling it was something really easy, but for some reason I cant figure it out. I wanna measure from source id: 51145. How much do I have to change to create a new view with an alpha shape? If you want a new view, you just have to specify a different name, so something else than net.test, e.g. net.test2 would do. Do you have any suggestions how to this: https://anitagraser.com/2011/09/25/a-closer-look-at-alpha-shapes-in-pgrouting/ today? It seems as if the pgRouting commands have changed since 2011? And just replacing ‘points_as_polygon’ with ‘pgr_pointsaspolygon’ doesn’t do the trick. Have you studied GIS or are you self-taught? Don’t worry, Jonas. I did a Masters in Geomatics. All open source GIS is self-taught. PgRouting has changed because they released 2.0 which is quite different from 1.x versions. For more recent posts check https://anitagraser.com/tag/pgrouting/. The post states ON di.id1 = pt.id;. Maybe that’s the problem. I would be grateful if you could help me with this. Ok thanks anyway, probably I did something wrong. It’s only possible to help if you post the whole query. and still have the same error…sory for my bad english. Check if the single quotes (‘) copied as straight single quotes. Try typing them again. Typed all query but no change…thanks again for trying help.